The American School Counselor Association says, "Elementary school counselors are educators uniquely trained in child development, learning strategies, self-management and social skills, who understand and promote success for today’s diverse students." This perfectly describes elementary counselor, Mrs. Wuebben. She holds weekly guidance lessons with each grade level. The aim is for the children to gain a better understanding of emotions and empathy. Building that understanding helps students learn what it takes to be a good teammate and how teamwork can impact their lives. 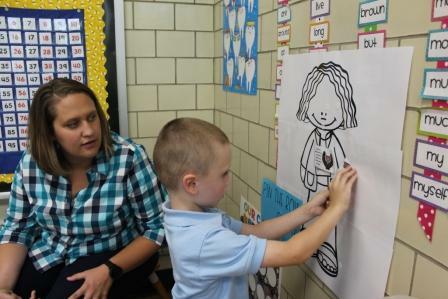 In Mrs. Wuebben's classes, primary students will explore different emotions while learning how these emotions help them to become a better learner and friend. Intermediate students will learn about problem-solving and have a basic understanding of how our brain controls our emotions. In addition, sixth grade students have a special unit on goal-setting and organization. They will additionally learn about stress: the impact it has on our bodies and coping strategies for dealing with it. These elementary guidance lessons give students tools they need to be confident learners. If you have questions about our guidance program, please contact Mrs. Gabby Wuebben at gwuebben@villamadonna.net.